A governor possesses executive, legislative, financial and judicial powers more or less analogous to the President of India. However, he has no diplomatic, military or emergency powers like the president. Q.2) Which among the following statements are true with regard to Governor? He is the chief executive head of the state. He acts as an agent of the central government. He is appointed by the president by warrant under his hand and seal. Even though the office of governor is an employment under the Central government, it is not under its control or it’s subordinate. The governor is the chief executive head of the state. But, like the president, he is a nominal executive head (titular or constitutional head). The governor also acts as an agent of the central government. Therefore, the office of governor has a dual role. The governor is neither directly elected by the people nor indirectly elected by a specially constituted electoral college as is the case with the president. He is appointed by the president by warrant under his hand and seal. In a way, he is a nominee of the Central government. The office of governor of a state is not an employment under the Central government. It is an independent constitutional office and is not under the control of or subordinate to the Central government. Constitution has assigned a dual role to the office of a governor in the Indian federal system. He is the constitutional head of the state as well as the representative of the Centre (i.e., President). Q.3) The Chief Minister enjoys which of the following powers as head of the state council of ministers? He allocates and reshuffles the portfolios among ministers. He can make rules for more convenient transaction of the business of a state government and for the allocation among the ministers of the said business. The Chief Minister allocates and reshuffles the portfolios among ministers. He can ask a minister to resign or advise the governor to dismiss him in case of difference of opinion. He presides over the meetings of the council of ministers and influences its decisions. The CM guides, directs, controls and coordinates the activities of all the ministers. However, the power of making rules for more convenient transaction of the business of a state government and for the allocation among the ministers of the said business belong to the executive powers and functions of the Governor and not the Chief Minister. The financial powers and functions of the governor include that he sees the Annual Financial Statement (state budget) is laid before the state legislature. Therefore, both statement (2) and (3) are powers of the Governor and not the Chief Minister. 7th Constitutional Amendment Act of 1956 facilitated the appointment of the same person as a governor for two or more states. Governor is entitled to such emoluments, allowances and privileges as may be determined by Parliament. When the same person is appointed as the governor of two or more states, the emoluments and allowances payable to him are shared by the states in such proportion as determined by the Parliament. Usually, there is a governor for each state, but the 7th Constitutional Amendment Act of 1956 facilitated the appointment of the same person as a governor for two or more states. The Constitution lays down that the Governor is entitled to such emoluments, allowances and privileges as may be determined by Parliament. It also lays down that when the same person is appointed as the governor of two or more states, the emoluments and allowances payable to him are shared by the states in such proportion as determined by the president. Q.5) Which of the statements given above is/are true about the Governor? The oath of office to the governor is administered by the President or some person appointed in that behalf by him. The term of the governor is not fixed and he holds office during the pleasure of the president. The oath of office to the governor is administered by the chief justice of the concerned state high court and in his absence, the senior-most judge of that court available. Every person discharging the functions of the governor also undertakes the similar oath or affirmation. A governor holds office for a term of five years from the date on which he enters upon his office. However, this term of five years is subject to the pleasure of the President. Further, he can resign at any time by addressing a resignation letter to the President. Q.6) Which of the statements given below is/are true with regard to composition of Legislative Council? The maximum strength of the council is fixed at one-third of the total strength of the legislative assembly and the minimum strength is fixed at 40. 5/6 of the total number of members of a legislative council are indirectly elected and 1/6 are nominated by the governor. The maximum strength of the legislative council is fixed at one-third of the total strength of the legislative assembly and the minimum strength is fixed at 40. Note: The minimum strength fixed at 40 by the Constitution of India is not applicable to Jammu and Kashmir. Its council has 36 members under the provisions of its own state Constitution. the remainder are nominated by the governor from amongst persons who have a special knowledge or practical experience of literature, science, art, cooperative movement and social service. He is the chief spokesman of the state government. He is the crisis manager-in-chief at the political level during emergencies. He is the political head of the services. All executive actions of the government of a state are formally taken in his name. All executive actions of the State are formally taken in the name of the Governor (not Chief Minister). Hence, statement (d) is incorrect. He is the chairman of the State Planning Board. He acts as a vice-chairman of the concerned zonal council by rotation, holding office for a period of one year at a time. He is a member of the Inter-State Council and the National Development Council, both headed by the prime minister. As a leader of the state, he meets various sections of the people and receives memoranda from them regarding their problems, and so on. He may give his assent to the bill, the bill then becomes an Act. He may withhold his assent to the bill, the bill then ends and does not become an act. Thus, the President cannot return a money bill for the reconsideration of the state legislature (as in the case of the Parliament). He can promulgate an ordinance only when he is satisfied that circumstances exist which render it necessary for him to take immediate action. His ordinance-making power is not a discretionary power. He needs no instruction from the President for making any ordinances. An ordinance issued by him ceases to operate on the expiry of six weeks from the reassembly of the state legislature. Governor can promulgate an ordinance only when he is satisfied that circumstances exist which render it necessary for him to take immediate action. His ordinance-making power is not a discretionary power. This means that he can promulgate or withdraw an ordinance only on the advice of the council of ministers headed by the chief minister. If a bill containing the same provisions would have required the previous sanction of the President for its introduction into the state legislature. If he would have deemed it necessary to re-serve a bill containing the same provisions for the consideration of the President. If an act of the state legislature containing the same provisions would have been invalid without receiving the President’s assent. An ordinance issued by him ceases to operate on the expiry of six weeks from the reassembly of the state legislature. It may cease to operate even earlier than the prescribed six weeks, if a resolution disapproving it is passed by the legislative assembly and is agreed to by the legislative council (in case of a bicameral legislature). Parliament has the power to create or abolish the legislative Council in various States on the basis of resolutions adopted by two thirds majority in the respective Assembly. Article 169 has given power to the States to set up the Council or abolish it. The legislative Council or the Vidhan Parishad is the Upper Chamber of the State legislature. The process of creating an Upper House is lengthy. The State Assembly has to pass a resolution for the creation of the Council by a majority of its total membership. Thereafter, Parliament has to enact a law to create it. In other words, the Union Parliament has the power to create or abolish the legislative Council in various States on the basis of resolutions adopted by two thirds majority in the respective Assembly. The power of abolition and creation of the State legislative council is vested in Parliament of India as per article 169. When a legislative council is created or abolished, the Constitution of India is also changed. However, still, such type of law is not considered a Constitution Amendment Bill. (Article 169). In other words, this Act of Parliament is not to be deemed as an amendment of the Constitution for the purposes of Article 368 and is passed like an ordinary piece of legislation (ie, by simple majority). The resolution to create and abolish a state legislative council is to be assented by the President also. Q.11) Which among the following statements is/are true with regard to Disqualification on Ground of Defection? The question of disqualification under the Tenth Schedule is decided by the Chairman, in the case of legislative council and, Speaker, in the case of legislative assembly. Supreme Court has ruled that the decision of Chairman/Speaker in this regard is subject to judicial review. The Constitution lays down that a person shall be disqualified for being a member of either House of state legislature if he is so disqualified on the ground of defection under the provisions of the Tenth Schedule. The question of disqualification under the Tenth Schedule is decided by the Chairman, in the case of legislative council and, Speaker, in the case of legislative assembly (and not by the governor). In 1992, the Supreme Court ruled that the decision of Chairman/Speaker in this regard is subject to judicial review. The Constitution does not provide for the mechanism of joint sitting of both the Houses to resolve the disagreement between the two Houses over a bill. The ultimate power of passing an ordinary bill is vested in the assembly. The Constitution does not provide for the mechanism of joint sitting of both the Houses to resolve the disagreement between the two Houses over a bill. On the other hand, there is a provision for joint sitting of the Lok Sabha and the Rajya Sabha to resolve a disagreement between the two over an ordinary bill. Moreover, when a bill, which has originated in the council and was sent to the assembly, is rejected by the assembly, the bill ends and becomes dead. Thus, the council has been given much lesser significance, position and authority than that of the Rajya Sabha at the Centre. The ultimate power of passing an ordinary bill is vested in the assembly. At the most, the council can detain or delay the bill for a period of four months—three months in the first instance and one month in the second instance. After a money bill is passed by the legislative assembly, it is transmitted to the legislative council for its consideration. The legislative council has restricted powers with regard to a money bill. It cannot reject or amend a money bill. It can only make the recommendations. It must return the bill to the legislative assembly within 14 days, whether with or without recommendations. If the legislative council does not return the bill to the legislative assembly within 14 days, the bill is deemed to have been passed by both the Houses at the expiration of the said period in the form originally passed by the legislative assembly. Articles 356 enables the Central Government to intervene in state affairs for the sake of good government of the State concerned. The Centre decides on the question of whether there is good government or not in the state. The Centre is not given any such authority to intervene in state affairs for the sake of good government. Article 356 allows the Centre to intervene only when the government is not carried on in consonance with the provisions laid down for the constitutional governance. On question on whether there is good government or not in the state is not for the Centre to determine. Q.15) Which of the statements given below is/are correct in regard to Lt. Governor of Delhi? The Chief Minister of Delhi is appointed by the Lt. Governor. The Council of Ministers headed by the Chief Minister aid and advise the Lt. Governor in the exercise of his functions. Lt. Governor is empowered to promulgate ordinances when the assembly is dissolved or suspended or in recess. The chief minister of Delhi is appointed by the President (not by the lt. governor). Hence, statement (1) is wrong. The other ministers are appointed by the president on the advice of the chief minister. The ministers hold office during the pleasure of the president. The council of ministers headed by the chief minister aid and advise the lt. governor in the exercise of his functions except in so far as he is required to act in his discretion. In the case of difference of opinion between the lt. governor and his ministers, the lt. governor is to refer the matter to the president for decision and act accordingly. The Lt. governor is empowered to promulgate ordinances during recess of the assembly. An ordinance has the same force as an act of the assembly. Every such ordinance must be approved by the assembly within six weeks from its reassembly. He can also withdraw an ordinance at any time. But, he cannot promulgate an ordinance when the assembly is dissolved or suspended. Hence, statement (3) is wrong. Further, no such ordinance can be promulgated or withdrawn without the prior permission of the President. The scheme will provide a cover of Rs.5 lakh per family per year. Only hospitalization expenses will be a part of the cover. It will subsume Rashtriya Swasthya Bima Yojana (RSBY) and the Senior Citizen Health Insurance Scheme (SCHIS). PM Modi’s ambitious scheme aims to provide coverage of ₹5 lakh per family annually and benefiting more than 10 crore poor families in the country. AB-NHPM will subsume the on-going centrally sponsored schemes — Rashtriya Swasthya Bima Yojana (RSBY) and the Senior Citizen Health Insurance Scheme (SCHIS). This scheme has the benefit cover of Rs. 5 lakh per family per year. The target beneficiaries of the proposed scheme will be more than 10 crore families belonging to poor and vulnerable population based on SECC database. The Rs. 5 lakh per family a year cover will take care of almost all secondary care and most of tertiary care procedures. To ensure that nobody is left out (especially women, children and elderly) there will be no cap on family size and age in the scheme. The benefit cover will also include pre- and post-hospitalisation expenses. All pre-existing conditions will be covered from day one of the policy. A defined transport allowance per hospitalisation will also be paid to the beneficiary. Also, benefits of the scheme are portable across the country and a beneficiary covered under the scheme will be allowed to take cashless benefits from any public/private empanelled hospital across the country. AB-NHPM will be an entitlement based scheme with entitlement decided on the basis of deprivation criteria in the SECC database. It shall be mandatory for all training/educational programmes/courses to be NSQF-compliant. Q.18) With respect to Article 239AA of Constitution Delhi assembly can legislate on all those matters listed in the State List and Concurrent List as are applicable to union territories, excluding which of the following? Sixty-ninth amendment act inserted Article 239AA which confers a special status to Delhi among UTs where it was a provided with a legislative assembly to make laws on state subjects. As per Article 239AA – Public Order, Police & Land in NCT of Delhi fall within the domain and control of Central Government which shall have the power to make laws on these matters. For remaining matters of State List or Concurrent List, in so far as any such matter is applicable to UTs, the Legislative Assembly shall have power to make laws for NCT of Delhi. Further, for Offences against laws, Jurisdiction & powers of Courts (except SC) and Fees (except court fees) so far as they relate to Public Order, Police & Land in NCT of Delhi; Central Government would have power to make laws. Q.19) Recently, some states are racing to gain special status which confers preferential treatment in the form of central assistance and tax breaks. Which among the following are the conditions to categorize states for special status? The concept of a special category state was first introduced in 1969. The 5th Finance Commission decided to provide certain disadvantaged states with preferential treatment in the form of central assistance and tax breaks. Initially three states Assam, Nagaland and Jammu & Kashmir were granted special status but since then eight more have been included Arunachal Pradesh, Himachal Pradesh, Manipur, Meghalaya, Mizoram, Sikkim, Tripura and Uttarakhand. Recently, states like Andhra Pradesh, Orissa, West Bengal, Bihar, Tamil Nadu are racing for the special status. non-viable nature of state finances. Q.20) Which one of the following statements correctly describes the Fourth Schedule of the Constitution of India? Led by the World Bank, the Global Platform for Sustainable Cities (GPSC) is a forum for knowledge sharing and partnership to achieve urban sustainability. The GPSC promotes an integrated approach to urban development, focusing on urban sustainability indicators, planning, and financing. 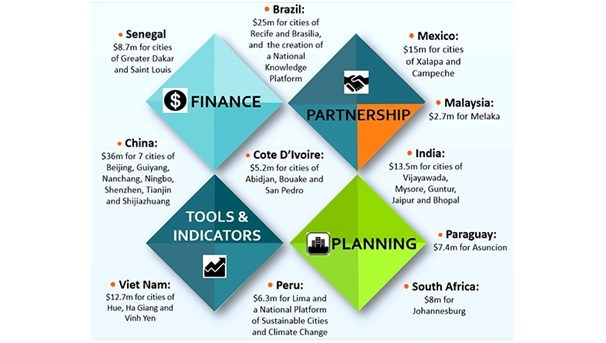 Funded by the Global Environment Facility (GEF), the platform currently comprises of 28 cities across 11 countries. It represents the accumulated net balance of unrealised gains and losses arising out of valuation of Foreign Currency Assets (FCA) and gold. Increase in gold price and depreciation of the rupee decreases the CGRA fund. Unrealised gains/losses on valuation of Foreign Currency Assets (FCA) and gold due to movements in the exchange rates and/ or price of gold are not taken to the Profit & Loss Account but instead booked under a balance sheet head named as the Currency and Gold Revaluation Account (CGRA). Unlike the Contingency Reserve (CR), which is created by apportioning realised gains, the CGRA is not a reserve account as it represents the accumulated net balance of unrealised gains and losses arising out of valuation of FCA and gold. As CGRA balances mirror the changes in prices of gold and in exchange rate, its balance varies with the size of asset base and volatility in the exchange rate and price of gold. In the recent past, even though FCA and gold have declined as a percentage of total assets, the CGRA has risen due to sharp depreciation of Indian Rupee against US Dollar. It, thus, acts as a cushion against fluctuations in exchange rates/price of gold which have in the recent times exhibited sharp volatility. The CGRA shows fund that is available to compensate RBI’s loss in the value of gold and foreign exchange reserve holdings. Gains and losses of the values of Gold and Foreign Currency Assets decreases or increases the CGRA money. Thus, changes in the market value of gold and forex assets (like the US Government securities where the RBI invested its foreign exchange reserves) is reflected in the CGRA. CGRA provides a buffer against exchange rate/gold price fluctuations. When CGRA is not enough to fully meet exchange losses, it is replenished from the contingency fund. Increase in gold price and depreciation of the rupee increases the CGRA fund. It aims to promote farmer producers organisations, agri-logistics, processing facilities and professional management. The operation aims to aid farmers and help control and limit the erratic fluctuations in the prices of onions, potatoes and tomatoes. It is essentially a price fixation scheme that aims to ensure farmers are given the right price for their produce. It was announced in the Budget speech of 2018-19 with an outlay of Rs 500 crores to stabilize the supply of Tomato, Onion and Potato(TOP) crops and to ensure availability of TOP crops throughout the country round the year without price volatility. If an “accused has not been tried at all and convicted or acquitted, the principles of double jeopardy cannot be invoked at all. The judgment is based on an appeal filed by the State of Mizoram against an order passed by the Gauhati High Court in August 2015, upholding a Special Court decision to decline to entertain a second chargesheet filed in a corruption case against the accused, Dr. C. Sangnghina, on the ground of double jeopardy. Article 20 (2) of the Constitution mandates that a person cannot be prosecuted or punished twice for the same offence. High-throughput satellite (HTS) is a classification for communications satellites that provide at least twice, though usually by a factor of 20 or more, the total throughput of a classic FSS satellite for the same amount of allocated orbital spectrum thus significantly reducing cost-per-bit. GSAT-19, the first of the series (HTS), was sent up in June 2017 from Sriharikota. Purandara Dāsa was a Haridasa (a devotee – servant of Lord Hari (Vishnu)), great devotee of Lord Krishna (an incarnation of Lord Vishnu) and a saint. He was a disciple of the celebrated Madhwa philosopher-saint Vyasatirtha, and a contemporary of yet another great Haridasa, Kanakadasa. He was a composer, singer and one of the chief founding-proponents of the South Indian classical Music (Carnatic Music). In honor of his significant and legendary contributions to Carnatic Music, he is widely referred to as the Pitamaha (lit, “father” or the “grandfather”) of Carnatic Music. He is respected as an avatara (incarnation) of the great sage Narada (a celestial being who is also a singer). Purandara Dasa is noted for composing Dasa Sahithya, as a Bhakti movement vocalist, and a music scholar. His practice was emulated by his younger contemporary, Kanakadasa. Purandara Dasa’s Carnatic music compositions are mostly in Kannada, while some are in Sanskrit. He signed his compositions with the ankita (pen name) “Purandara Vittala” (Vittala is one of the incarnations of the Hindu god Vishnu). In the course of his wandering he met the holy sage Vyasatirtha, one of the chief exponents of Madhwa philosophy and the rajaguru of Krishnadevaraya, the emperor of Vijayanagara kingdom. Purandara Dasa traveled extensively through the length and breadth of the Vijayanagara empire in Karnataka, Tirupati, Pandharapura composing and rendering soul stirring songs in praise of god. He spent his last years in Hampi and also sang in Krishnadevaraya’s durbar. Gita Govinda: is a work composed by the 12th-century Indian poet, Jayadeva. It describes the relationship between Krishna and the gopis (female cow herders) of Vrindavana, and in particular one gopi named Radha. Dakshayagam (The Fire-Sacrifice of Daksha) is a Kathakali play(Aattakatha) authored by Irayimman Thampi in Malayalam. Shankara’s masterpiece of commentary is the Brahmasutrabhasya, a fundamental text of the Vedanta school of Hinduism. He believed that, Hinduism asserts ‘Soul and Self’ whereas Buddhism asserts that there is ‘no Soul, no Self’. Adi Shankara was an early 8th century Indian philosopher and theologian who consolidated the doctrine of Advaita Vedanta. He is credited with unifying and establishing the main currents of thought in Hinduism. Adi Shankara is most known for his systematic reviews and commentaries (Bhasyas) on ancient Indian texts. Shankara’s masterpiece of commentary is the Brahmasutrabhasya (literally, commentary on Brahma Sutra), a fundamental text of the Vedanta school of Hinduism. His works in Sanskrit discuss the unity of the ātman and Nirguna Brahman “brahman without attributes”. He wrote copious commentaries on the Vedic canon (Brahma Sutras, Principal Upanishads and Bhagavad Gita) in support of his thesis. His works elaborate on ideas found in the Upanishads. Shankara’s publications criticised the ritually-oriented Mīmāṃsā school of Hinduism. He also explained the key difference between Hinduism and Buddhism, stating that Hinduism asserts “Atman (Soul, Self) exists”, while Buddhism asserts that there is “no Soul, no Self”. Q.30) NASA’s flagship mission, the Chandra X-ray observatory is named after a famous person of Indian origin. Name the person? The Chandra X-ray Observatory (CXO), previously known as the Advanced X-ray Astrophysics Facility (AXAF), is a Flagship-class space observatory launched by NASA on July 23, 1999. The telescope is named after the Nobel Prize-winning Indian-American astrophysicist Subrahmanyan Chandrasekhar. NASA’s Chandra X-ray Observatory is a telescope specially designed to detect X-ray emission from very hot regions of the Universe such as exploded stars, clusters of galaxies, and matter around black holes. Because X-rays are absorbed by Earth’s atmosphere, Chandra must orbit above it, up to an altitude of 139,000 km (86,500 mi) in space.